One night, one hall, two fine quartets. I know NYC is supposedly the place to live if you love jazz, but tonight you’d have a tough time convincing me that anywhere is better than Minneapolis. Coltrane, second son of John and Alice, named for sitar legend Shankar, begins with a tune Ralph Alessi wrote for William, Ravi’s young son, called “One Wheeler Will.” It’s a high-energy tune right out of the gate that gives everyone a chance to shine. This is the second time I’ve seen this quartet (the first was at the Dakota in March 2005) and I wonder if Ravi ever plays his father’s music. Ravi looks beautiful. His hair is cropped short, his glasses are cool, and he’s wearing a shirt of something black and drapey—silk or cashmere. I’m musing on his elegance, enjoying the music, when I hear a brief but familiar phrase on the piano. Ravi’s horn is fierce and Perdomo is packing as many notes as possible into each measure. That phrase again. Either the quartet is playing “Giant Steps,” the most iconic of John Coltrane compositions, or Perdomo is teasing us with quotes. In fact, they are playing it. Ravi has turned his father’s most recognizable tune—and one that’s famously hard to play—into a personal statement. Side note: Although Ravi’s soprano saxophone is on stage with him, he never picks it up. This is a tenor-only night. 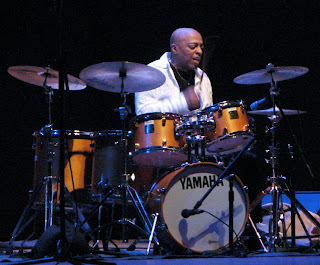 During intermission, Utne Reader editor and jazz lover David Schimke tells us that Roy Haynes has made more recordings than any other jazz artist. Over the 60-plus years Haynes has been out there beating his drums (on the night of this show, he’s a week away from turning 83), he’s played with everyone: Lester Young, Bud Powell, Miles Davis, Charlie Parker, Sonny Rollins, Sarah Vaughan, Thelonious Monk, Eric Dolphy, Stan Getz, John Coltrane, Chick Corea, Pat Metheny, Roland Kirk.... His label, Dreyfus, recently released a box set that spans his career. For those of us who have seen Haynes at his most recent Artists’ Quarter appearances and heard his latest CDs (including Whereas, recorded live at the AQ), the set list is familiar: “Green Chimneys,” “My Heart Belongs to Daddy,” Monk’s “Twinkle Trinkle,” Pat Metheny’s “James.” (Shaw tells us later that the cue for “James” came sooner than he expected. He’s standing at stage right when Haynes begins the tune and literally sprints to center stage with his alto sax and starts blowing.) As an encore, they give us “Summer Nights.” No surprises, but no complaints. What does Roy Haynes hear in his head as he goes about his day? Does everything he encounters have a pulse? 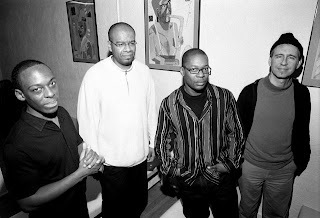 Photo of the Ravi Coltrane Quartet from his Web site, (C) Darlene DeVita. Photos of Roy Haynes and his quartet by John Whiting.